What is the purpose of the Spacemaster Containers? 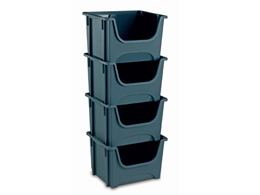 The spacemaster containers are designed to help people preserve the space in their home, office, or workplace. They can be nested so they don’t take up much room when they are not in use, and they can also be stacked on top of each other when they are full of items. Half of the front of the container is exposed so someone can reach inside and grab what they need when the items are stacked. 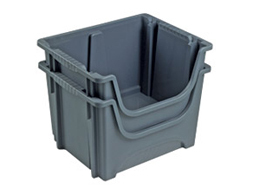 These containers also have carrying handles on the sides of them so they can be used to move the items inside with ease. 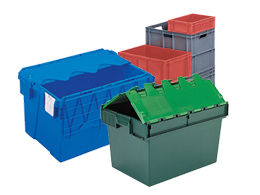 Each container has a carrying capacity of 50 Litres or 15kgs. Because they are made out of propylene, they will also protect anything that’s being stored inside from absorbing moisture and will prevent any damage to the items if a spill happens. The spacemaster containers can be used in many different places, but the most common will likely be an office setting. People may want to put their finished, unfinished, thrown out, and shredded paperwork in separate containers so their office doesn’t become cluttered and they forget which paper is supposed to go in which pile. Because the containers stack on top of one another, they are a perfect substitute for a file cabinet. They are also much easier to transport than a file cabinet because they have handles on the side. It’s also possible to add or remove one container with little difficulty, which is not something that a file cabinet can boast. These containers could also be used to store other items, not just paperwork. An office employee will likely be able to make good use of these containers. However, people can also make use of them at home if they are looking for an easy way to store their possessions. 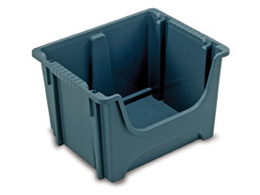 The most common reason people use these containers is to store their paperwork, though. If needed, they could be used by a homeowner to store things in the garage and keep them in an orderly fashion. The spacemaster containers come with a 1 year parts and labour warranty. They also come in packs of five, so one pack takes up about the same space as a regular file cabinet.